Recently I invested in a new band for my Apple Watch. Don't get me wrong, I like the default band that comes with the Apple Sport model, but, a little flair doesn't hurt. That being the case, my other reason includes making my watch easier to secure. Something that stood out to me with the resurgence of the wearable market is their sheer intrinsic value. I feel that in the past decade with the wave of smartphones becoming increasingly utilized, the watch market has diminished to a certain degree, and we forget that pickpocketing watches was/is a big deal. That being the case, the bands that Apple has released, while nice looking and easy to remove, may be easy to steal. Secondly, the bands that Apple have really are quite expensive and I feel to high in value. So I looked for a new band, and Monowear stood out to me, especially given the success of their KickStarter campaign. I elected to buy the nylon band, for $59.99. After placing my order, the package was delivered about four weeks later. The delivered product was very nice. 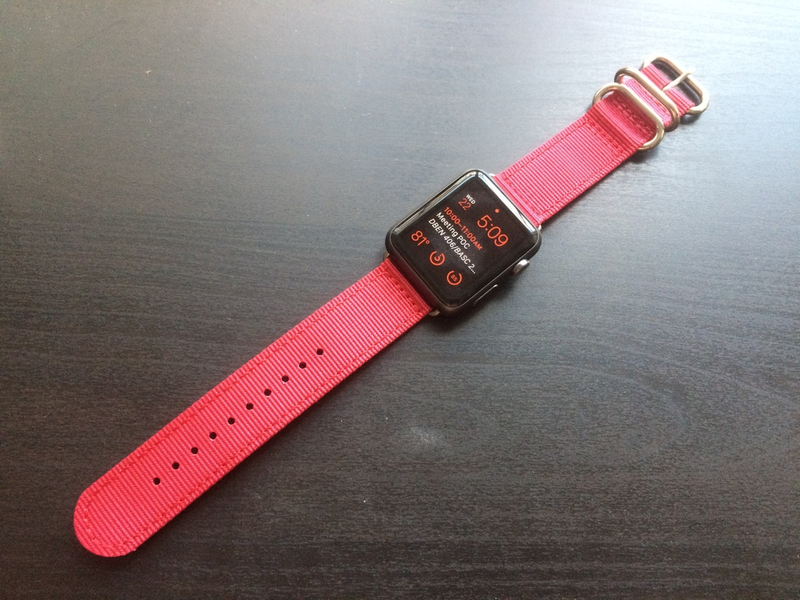 I have previously commented that I prefer nylon type straps on my watches, and the quality of this band was fairly good. The band was easy to install and fit quite snuggly. The engineering and machining of the straps is pretty good, and does not jostle around. I have so far worn the band for the past three weeks, and really have nothing to complain about. It's comfortable, and no fraying or tearing of stitching has been noticed. Based on how much I liked the band, I made another purchase and got the red nylon version, which I think looks quite nice as well. So how would I rate the nylon band? Comfort Level - 4/5 - The straps takes a bit to break into, but after a week or so wearing it is comfortable to wear daily. Cost - 4/5 - While cheaper than other Apple Watch branded bands, it's still a little more than those currently available off of Amazon. However, still haven't tried those so I can't comment on their quality. Developer Support & Communication - 4.5/5 - Monowear Design was very easy to work with and their billing process was easy enough. They sent frequent emails telling me when their products were going to be delivered, and had no issues with the whole process. Overall, based on the quality of the bands. I may invest in the leather or metal bands at another time, but to be honest, the nylon bands I am pretty satisfied with. The customer service from MonoWear was also nice and were very communicative with continual updates.